Bruce Wendlandt is a life long native of Kansas City. He holds a Bachelor of Architecture and Bachelor of Environmental Design from the University of Kansas and is licensed to practice architecture in Kansas, Missouri and Colorado. After ten years of professional experience, Bruce founded Wendlandt & Stallbaumer in 1993. He is a member of the American Institute of Architects. 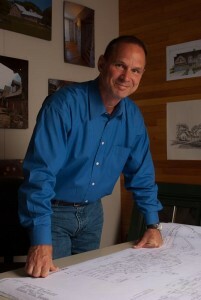 Bruce’s work has won numerous design awards and been published locally and nationally. Architectural design can be experienced through so many rich and divergent vocabularies; all of which are genuinely exciting to me. It is of utmost importance to first thoroughly understand the lifestyle, goals, values and needs of the individuals that we serve. Upon comprehension of their ‘un-built’ environment, design of the built environment is an exciting time of exploration to be enjoyed by all, ultimately manifesting itself in a physical structure that is both a place one affectionately calls ‘home’ as well as an expression of one’s individuality. Bruce began designing homes in third grade and never stopped. His wife and children wait to see if the construction remodel projects around the home will ever stop.